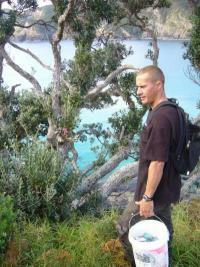 Today (27th July 2011) we have agreed to 2011 and 2012 Nga Whenua Rahui contracts. Basically, we have fulltime work for two trappers for 150 days commencing 1st September 2011 and fulltime to end of March 2012. There are some smaller ones that will kick in around April/May doing bird count surveys, etc. This contract does not include a supervisor or any auditing costs but we won’t have as many as last time when the money disappeared into supervising bigtime. These costs will sit with Ngati Whenua Rahui. The two trappers will be Alvin the team leader and Darrell Heywood. They are currently working out at Deep Water Cove on the DOC estate. The map below shows the different areas being worked on for pest control. Alvin and Darryl are currently working the green area at the Cape. They will work the blue area later. Map of the whole area of the projects to restore the bird life. 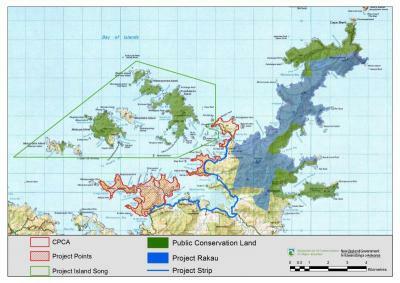 The red zone is the Buffer Zone which is a buffer for stopping reinvasion of the islands besides clearing the areas of pests. Rana Rewha and John Clendon are working the coastline between the mainland and the islands which is constantly monitored and trapped to stop reinvasion of rats on the islands. 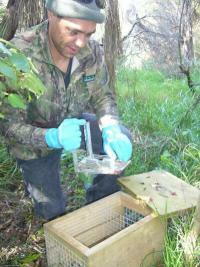 John Clendon (left) setting a stoat trap for Project Strip and Rana Rewha (right) at Oke Bay.